My mother is one of those women who emits "lady" from every pore of her skin and every movement she makes. She's the kind of woman who walks into a bar and every man stops cursing, not because they have to but out of respect for the presence of a lady having entered the room. 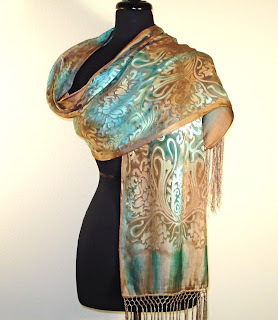 Wild Ginger Silk is a shop that's filled with one-of-a-kind fiber art fashion by the very talented Sheila and I would like to share a bit from her profile here today to help introduce you to this wonderful and enthusiastic artist. "I paint in watercolor and have been a hand-weaver for many years. For the past 3 years I have combined my love of fabric and my love of paint in my silk scarves and shawls. The first time I touched paintbrush to silk I was hooked. The way the paint flowed over the silk and the vibrant colors that you can create- wonderful! And then, when I saw my first customer try on the first shawl- I still remember the smile on her face! It's great to be able to share the result of something I love to do." 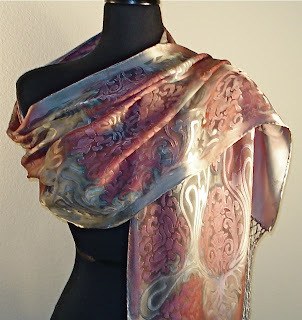 These hand-painted shawls, wraps, scarves, lace and fabrics are just gorgeous with brush strokes of fine French silk paints through luxurious silk making each piece a unique piece of art. There's even a beautiful Kimono as well as some beautiful brooches to browse through. This is a shop you won't want to miss and is sure to catch the breath of more than a few ladies out there with the wonderful pieces offered there. TO VISIT WILD GINGER SILK ON ETSY, YOU CAN CLICK THE PICTURES ABOVE OR, IF YOU'D RATHER, CLICK RIGHT HERE!